I'm looking for technical info or other useful info for Battlegrounds. If there is no thread here, does anyone know another site or forum or other info about the game? Maybe we can use this thread for this. A guy that does some analysis of for example spraypatterns and weapons. Anyone else have any additions? This post has been edited 1 times, last edit by "milky81" (May 17th 2017, 10:33am) with the following reason: Removed questionmark after Battlegrounds in title. If I had more time I would start to look into the files to see if I could get out any accurate numbers and whatnot. The patch notes just saying generic "Balanced assault rifles" gives me those bad vibes I had with Crysis 3 and whatnot (one of the reasons I found Symthic). Also I was linked with this while back, but dunno how the numbers were obtained and I believe it was pre-content patch. Thank you for the info! AFAI it is accurate regarding the bodyshots with ARs. dont know about the rest. C'mon symthic geniuses, get on this. 150K active players at peak times and no one really knows how the weapon attachments work or much of anything else. People to obtain and ascertain the information, as well as review it, certify it, expand upon it it, and use it. Just like the scientific method. The polite Tl;Dr of this is simple: If you want data then go collect the data. Research something, test it, write it up, post it, ask for people's opinions or inputs on what you've posted. Symthic's a fairly popular and well known site by now, so people will likely see what's been posted and make an account to add to it. Ironically, the whole site works almost on the very same scientific process of hypothesising and peer-reviewing that it also holds as it's centre belief! As for how far I got: Nothing definitive as I am not sure if I even was reading the right files. However since game works on UE and uses client-side hit detection (see this video), I bet the numbers can be found from files. Now there are some weapon specific files there but they are in some UE engine binary format, and thus far I have not been able to even reverse the wanted values (not even sure if they were correct). JackFrags also made a rather good video about weapon damage. 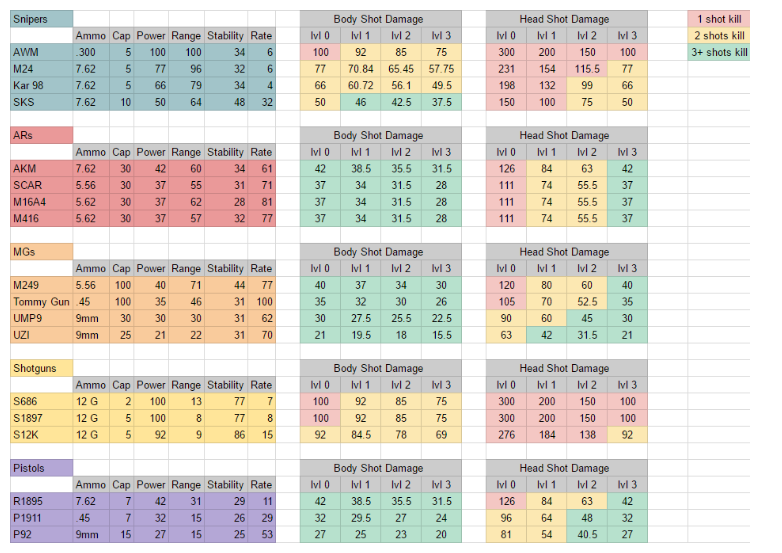 Not accurate, because it is just field testing, but it gives a rough idea how armour and damage works. I would almost say for a brand new game, field testing is the way to get more reliable info. Biggest issue with is the manual labor need to be done. If somebody were to read values from game memory/files, there still might be some non-one damage multipliers and whatnot like in case of BFs. Of course stuff like recoil/accuracy is harder to field test though. Supposedly more recently updated and in general just more info. I have a great NEED that must be satiated for more accurate stats.